I love a fabulous print, and the green and navy tartan pattern on today's dress is no exception. 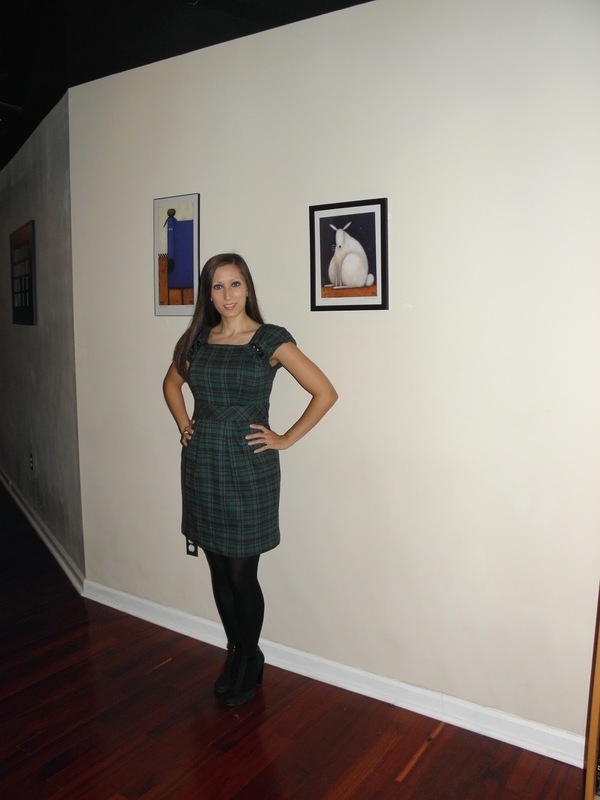 I bought the Nanette Lepore Pretty Plaid Dress back in 2009, so it's no longer available for purchase, but you can find other fabulous plaid prints from the designer online, including the Nanette Lepore On the Beat Plaid Dress. - The cap sleeves are endearing and help slim the arm. If you're self conscious about your arms, a cap or puff sleeve is always going to be your best bet. It cuts off to help make the arms look thinner. - The silhouette defines the waist, yet doesn't hug the hips to make you look bulky. As for accessories, I went pretty light today, since the decorative buttons on the dress are enough to grab the eye (so no necklace needed). I am wearing my sapphire and diamond earrings and using my Michele black purse. The shoes are the Black Suede Braid Elisha T-Strap Pumps from Modern Vintage. I could only find them on eBay; I bought these shoes over a year ago. I also thought today's picture looks pretty cool. We own a loft, so from first glance it looks like the wall above me just kind of ends... but we painted part of the upper wall and ceiling dark green to get that cool visual effect. I think the photo captures it just right.